(a) Remove the nut and disconnect the cooler refrigerant discharge hose No.1. (a) Remove the nut and disconnect the cooler refrigerant suction hose No.1. (c) Using a E8 torque socket wrench, remove the stud bolt. (d) Remove the 3 bolts and compressor and magnetic clutch. (a) Remove the bolt and the bracket. (a) Fit the parts as shown in the illustration and install the magnet clutch stator. Do not expand the snap ring by more than 30.5 mm (1.2 in) when installing it. NOTICE: Adjustment shall be performed with 3 or less magnet clutch washers. (d) Install bracket with the bolt. 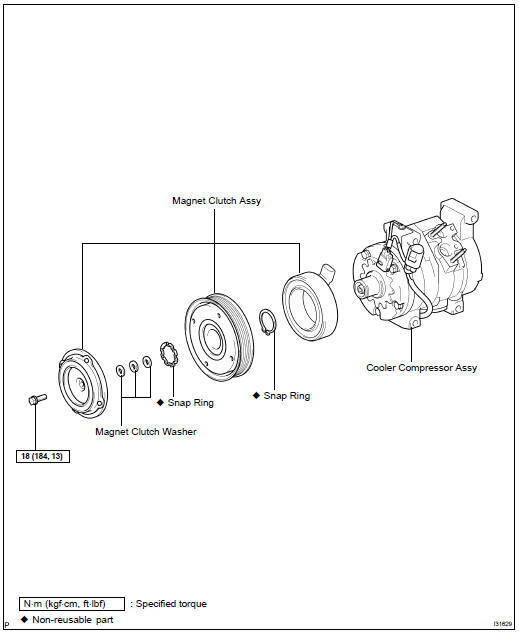 (a) When replacing the compressor and magnetic clutch with new one, after gradually removing the refrigerant gas from the service valve, drain the following amount of oil from the new compressor and magnetic clutch before installation. Because compressor oil remains in the pipes of the vehicle, if a new cooler compressor assy is installed without removing some oil inside, the oil amount becomes too much, preventing heat exchange in the refrigerant cycle and causing refrigerant failure. If the remaining oil in the removed cooler compressor assy is too small in volume, check for oil leakage. Be sure to use ND-OIL8 for compressor oil. (a) Install the compressor and magnetic clutch with the stud bolt, 3 bolts and nut. HINT: Do not over tighten the bolt until the compressor no longer moves. (b) Push down on the rear side of the compressor and fully tighten bolt B, bolt C, bolt A and nut in order. (b) Sufficiently apply compressor oil to the O-ring and fit surface of the compressor and magnetic clutch. (c) Install a new O-ring to the cooler refrigerant suction hose No.1. (d) Install the cooler refrigerant suction hose No.1 to the compressor and magnetic clutch with the nut. (b) Sufficiently apply compressor oil to the O-ring and fit surface of the compressor and magnetic clutch..
(c) Install a new O-ring to the cooler refrigerant discharge hose No.1.